I wrote about Angel’s Envy Bourbon when it was first introduced. The bourbon, created by Lincoln Henderson who previously wielded his talents to produce Woodford Reserve, is unique in that it is finished in port barrels after its traditional aging in new charred oak barrels. The result was delicious, with just the right amount of traditional, rich bourbon flavor and added complexity due to finishing in port barrels. Now Angel’s Envy is adding a rye to its lineup with a similar twist: This time they finish their traditional rye in Caribbean rum casks. It’s worth pointing out that while Angel’s Envy and its parent, Louisville Distilling Company, said they had plans to build their own distillery, none of their products are distilled by the company. In fact, according to bourbon writer Chuck Cowdery, any plans for a Louisvile Distilling Company distillery have been put on the back-burner. Of course, that doesn’t mean the whiskey in the bottles isn’t tasty, and clearly Angel’s Envy’s finishing process makes it a unique spirit. As for the rye, the company wouldn’t reveal the source of the whiskey, but there are some strong hints. The rye uses a mash bill recipe that is 95% rye and, as far as I know, only one company (Lawrenceburg Distillers Indiana) makes such a bill, and they happen to make it all for sale to other companies. So it’s fair to say I have a strong suspicion that this is the source of the rye which Angel’s Envy then takes and “finishes” in rum casks. Whatever the source, the result is a 100-proof rye that will sell for $70 per bottle when it comes out next month in a limited number of states. Even though the rye doesn’t carry a formal age statement, the company reports the it is aged for around 6 years before being transferred to the rum casks for up to 18 months. The color is a deep golden like well-aged Sauternes. On the nose, Angel’s Envy rye shows a fresh combination of pineapple, pear, pine, vanilla, and rum. A sip reveals plenty of alcohol heat but also sherry, oak, and maple candy. The finish shows soft woodiness, rum, and oak. It’s a very interesting, unique rye that is dominated by maple sweetness and tropical fruit with hints of characteristic rye spice. Frankly, if you didn’t know what was in your glass, you might find it difficult to identify it as a rye. Still, it’s enjoyable straight with a cigar. What it calls for is a flavorful cigar cigar with clean balance. I smoked two cigars with this rye that fit the bill: the Paul Garmirian Gourmet Series (well-aged if you can find it), and the Asylum, made by Christian Eiroa, formerly of Camacho. 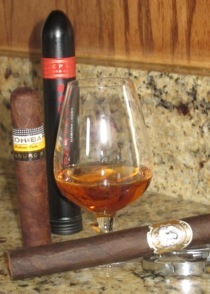 If I had more rye to sample with some other cigars, I’d be looking for other medium-bodied cigars with excellent balance. Ultimately, this is a far different rye than most (for example Bulleit, which is also made at LDI, the likely source of Angel’s Envy). But it’s uniquely enjoyable. If a rye that will change your opinion of what a rye can be sounds up your alley, then pick up a bottle of Angel’s Envy Rye finished in Caribbean rum casks in May when it arrives on store shelves. I will. Terrific. Thank you for posting that. I will check again to read more and tell my acquaintenances about your site.